Publications that aim to present what is true to life and what inspires the human spirit. Ten Questions With . 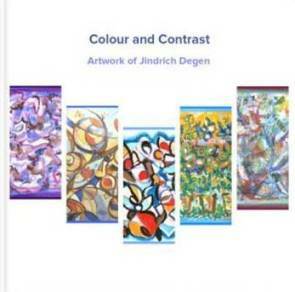 . .
Colour and Contrast – Artwork of Jindrich Degen is a collection of about 200 of Jindrich Degen’s paintings that has been arranged by his daughter, Eva, with assistance from her husband Alex. Jindrich actively participated in selecting, editing, titling, and categorizing each work of art in the book. The art in this collection is similar to Artistic Inspirations. The main difference is in the layout. In this book, each work of art appears on a separate page, whereas in the previous book, several works appear on a page. This collection exists in two formats – budget and deluxe. The budget edition is available through Amazon (where it can also be previewed) and many other online outlets. Australian readers may find a better value at Fishpond which sells discounted books and delivers them postage-free. Check it out by clicking on the images or links. For a preview and purchase information of the deluxe edition, click on the image below. The book is also available for a free download as ebook (ibook) under the title Artistic Inspirations at https://itunes.apple.com/au/book/artistic-inspirations/id640508809?mt=11 . Thank you for your paintings in which I see light and hope. I like the harmony of colours and shapes which give the impression of movement. Your artwork reflects optimism. The colours in Jindrich’s art are very positive, reflecting optimism, as well as purity and wholesomeness. His versatility is amazing – the way his artwork ranges from impressionism and abstract to portraits and still lifes. I like colours, freedom, and the resulting joy. This is exactly what I feel when I look at Jindrich’s pictures. I can imagine having some of them in my home. I looked through Jindrich’s artworks and found them fascinating. I especially like the painting “In the Forest.” There I feel that I understand the forest – being able to perceive how it lives, grows, and receives nourishment from the roots. Many thanks for the gifts that you have brought to us all through your long life of music and art. We are all the richer for your presence! I was interested to see so many mandala-like pieces – conveying a sense of completion – though I think my favourite work is “In the Forest”. Once again, thanks for the inspiration! 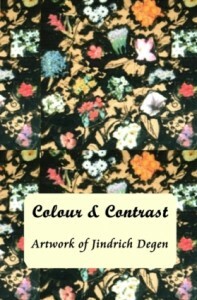 Other comments, more art, as well as a biography of Jindrich (Henry) Degen can be found on his website www.henrydegen.com. Feel free to make a comment or review the book at Amazon.